Hello lovies. I am back with another installment of my LOSTathon nails. Season four focuses on the survivors dealing with the arrival of people from the freighter, who have been sent to the island not as part of a rescue operation, but for far more nefarious purposes. The reason specifically for the freighter folks being there is revealed. The survivors begin planning a way to get off the island before the freighter crew can carry out their plan. Flashforwards reveal the identities and future actions of the so-called "Oceanic Six," a group of survivors who have escaped the island and attempted to resume their normal lives. In an attempt to "move the island" to safety, one of the others uses an ancient device on the island that not only moves the island physically but also moves it to another point in time, while simultaneously teleporting that other to a desert in Tunisia. 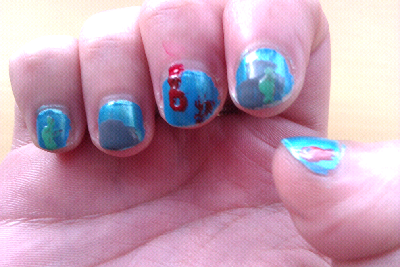 So my nails here showthe 'fake' 815 plane underwater. 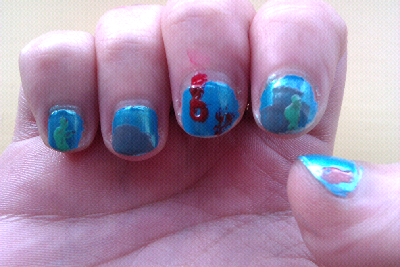 The red is some blood and a 6 to indicate the 6 who survived the accident (or in actuality got off the island). There is also a little fishy on my thumb. I used a selection of Barry M's for this ! So what were Kerrie's best bits this season? 2. Miles, Charlotte and Daniel. Although these characters come into the show late they are some of my favourites. They all have great characters! They show that even at season four LOST was still getting it right! 3. Kate becoming Aaron's mother. I love this side to Kate's character, she takes on a compleatly different role and it really suits her. 4. Sun gets to have her baby. This is a real aww moment. Although we all wish Jin had been there! 5.Micheal is back! That was a real shock! What annoyed me this season? Ben lets Alex get killed. Come on Ben I thought you were better than that! Anyway next time it's season 5!